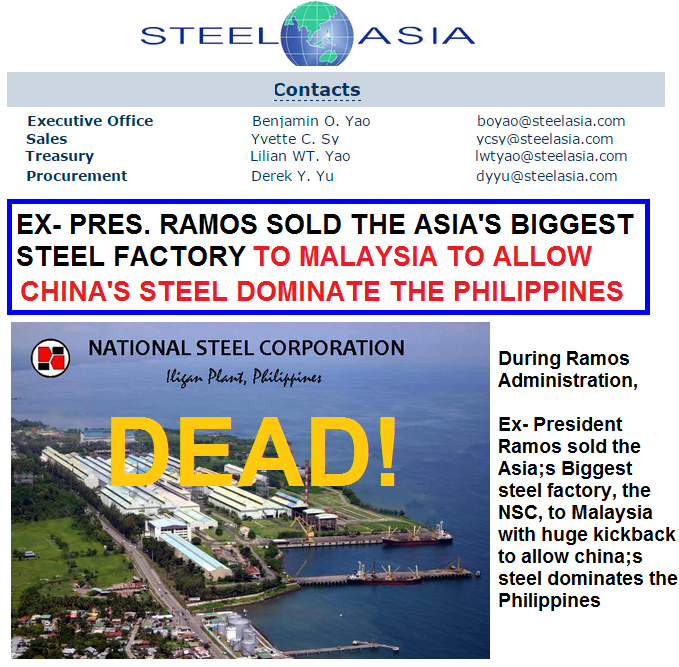 Former Philippine President Fidel V. Ramos Sold the National Steel Corporation (NSC) in Iligan City to Malaysia as part of his Privatization program. NSC was Asia's largest Steel factory. Steel Asia, the country’s largest steel manufacturer, is investing P6 billion to put up the biggest steel plant in the country. Steel Asia said the plant in Plaridel would be among the most modern in the world. “It will be using the latest available technology that allows production efficiency and environmental protection at the same time,” the company said. The Plaridel plant will have a production capacity of 1.2 million metric tons, more than double the capacity of its recently inaugurated P3 billion Davao plant which is at 500,000 metric tons. The Davao plant generated around 2,000 direct and indirect jobs while the Plaridel plant is expected to create nearly 3,000 direct and indirect jobs, Steel Asia said. Roberto Cola, Steel Asia vice president, said the Plaridel plant would feature an array of environmental measures that will allow the company to fully comply with existing laws. Despite various groups who are against the project, Steel Asia said majority of the residents of Plaridel are now supporting the rolling mill project in the area. Steel Asia said an independent survey conducted by Greenboroughs Tech Inc. showed 82 percent of the sampling from the direct impact area support the project. The company said it has been conducting continuing efforts to explain the technical and environmental aspects of the plant, and its benefits to the community and its environment. In an official public consultation conducted last month, Steel Asia said the project has obtained the support from more than 5,000 federation of tricycle associations of Plaridel. The project was also supported by the youth many of whom have already taken advantage of the free skills upgrade training program Steel Asia has been conducting for the community, the steel manufacturer said. “Being open and transparent with the community was key to the support we are getting for our project. We even brought some members of the Plaridel community to our newly opened Davao plant for them to see and appreciate that we are real partners in progress and we care for the environment as we go about our business,” Cola said. Steel Asia has existing plants in Cagayan de Oro, Davao, Cebu, Batangas, and two in Bulacan. While the government is moving heaven and earth to revive the country’s manufacturing sector, which is the biggest hope to provide employment to the less educated Filipinos who cannot be accepted in call centers and BPO works, it has lost sight of the country’s biggest industrial plant — the National Steel Corp. (NSC), which used to be the symbol of the country’s march towards industrialization. 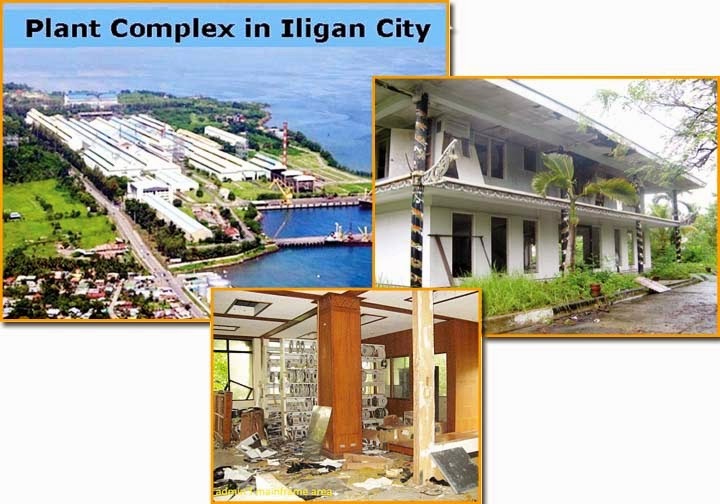 NSC has been abandoned, looted and is now rotting in its 145-hectare industrial complex in Iligan City. Cong. Vicente F. Belmonte Jr. of the lone legislative district of Iligan City in a phone interview with Business Bulletin blamed the national government policy for making NSC, which used to employ as many as 4,200 Filipinos, into what it is today — a big white elephant. “The national government they don’t give importance to the NSC. 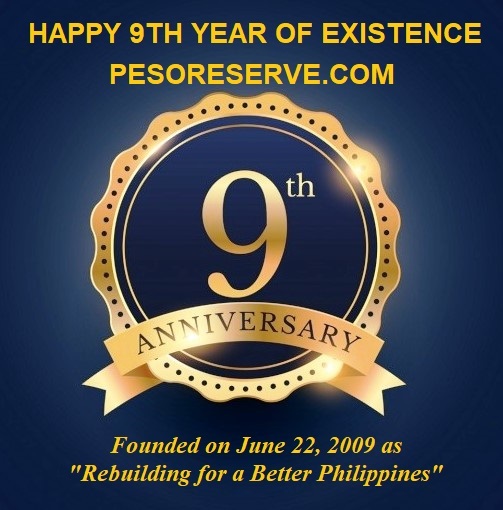 We are at the mercy of the national government because they make the policy,” Belmonte said. Belmonte noted of the privatization thrust that put NSC to owners that did not really take seriously the business of NSC. Under the government’s privatization policy, the NSC facilities were turned over to the Malaysian investors in 1995. The Indian investors subsequently took over in 2004 and the mills eventually went on total shutdown in 2009. “We made a mistake in awarding the NSC to the Indians,” Belmonte pointed out. NSC was acquired by Pramod Mittal’s Global Steel Holdings Ltd. from creditor banks in 2004 for a total price of P13.25 billion including an upfront cash of P1 billion while the remainder was to be paid over an 8-year period. That privatization was overseen by then DTI Secretary Mar Roxas. At that time of privatization, NSC’s debts were placed at P16.18 billion but its assets had been assessed at P29.27 billion. The Philippine National Bank (PNB) has the largest exposure to the company of R5.64-billion. Government-owned Land Bank of the Philippines followed with P1.2 billion. Belmonte said the Indian owners were not interested in running a sustainable plant but they only produced specific steel products to supply its mother company. Its intention was to use the NSC property as a collateral for its loan and when it failed to do so, it filed a case before Singaporean arbitration court and won. A source said, the Philippines or the creditor banks’ defense team was said to be poorly represented in that Singapore case making it an easy win for Global Steel. Now, Global Steel and creditors/banks are caught in an arbitration gridlock situation in Singapore. “We have many plans for NSC, but we need the national government’s support,” he said. According to Belmonte, he already approached Finance Secretary Cesar Purisima but the Finance chief was non-committal. He has also asked the Department of Trade and Industry, but was told the agency cannot do anything because NSC had long been privatized. Belmonte also confirmed the looting incidents inside the huge complex. He said that when NSC was privatized it had a R1 billion worth of parts inventory. Some of these have been looted or sold. Just last week, he said, some 61 trees inside the complex were balled off on the pretext that those grown up trees were on harms way of electric cables, but were actually sold for cash. “There are guards, but not enough to secure the entire premises,” he said. NSC, the first government corporation to obtain an ISO-certification, is complete with staff houses and other real estate assets inside its sprawling premises. It was also the first government corporation to be declared Employer of the Year. And also the first government corporation to be bestowed AIM’s Award for Managerial Excellence in people development. “We need government policy intervention for the steel industry,” Belmonte said. Policy interventions that should correct some factors that led to NSC’s fate. For instance, when NSC was sold to Global Steel, it had the advantage of a lower power cost at R3 only because Mindanao was then relying mostly on hydro power. But when the government policy was changed on the power mix for Mindanao, NSC was caught up with a high power of R6 to R8 per kilowatt-hour. The Indian owners closed the plant in 2009 after workers staged a strike for non-payment of wages. Along with its closure, the Global Steel also incurred over R3 billion in unpaid electricity bills before the National Power Corp. It also failed to pay real estate taxes amounting to over R2 billion to the city government of Iligan. Since the tide of trade liberalization can no longer be reversed, Belmonte said there are some new technologies that could possibly put NSC back on its feet. He said NSC can operate using its own generated power. “The national government should come in now and adopt a policy for the steel industry, because even if we in Iligan are very much interested in reviving NSC, we are very limited,” he stressed. Thus, he said, there is a need for government policy to attract new investors and revive NSC. “The government need not take over the plant, we just need a government policy that should make the domestic steel manufacturing industry attractive to investors again,” he stressed. While Belmonte admitted that the NSC as it is today can no longer be competitive, he said there are new technologies that could help NSC back on its feet and become competitive again. 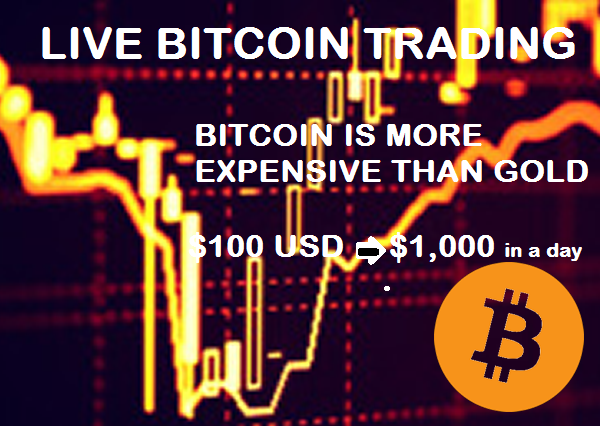 “We can revive it, but it is no longer competitive. We need new policy because we can no longer survive under the old strategy. We have to adapt new technology for the steel industry,” he said. For instance, he cited a Vienna technology where a steel plant can operate using its own power. When the NSC was privatized in 1995, it was on the premise that the new investors must further expand/upgrade and eventually integrate upstream into the iron and steel-making stage. Due to this failed privatization, the flat steel subsector has a serious supply-chain gap today arising from the idle Hot Mill, Cold Mill and Tinplate Line; while the long products subsector has a diminished supply capacity from the shutdown Billet Shop. NSC generated R12 billion in annual revenues and earned a net income of P500 million every year, after paying duties and taxes of R1 billion yearly to the government. Upon expansion/upgrading in 1985-1995, this government steel plant had total assets of R30 billion when it was privatized in 1995. In one of the DTI workshops for the crafting of the industry roadmaps, including the steel industry, state-run National Development Co. (NDC), which has a minority five percent stake in NSC, was urged by the private sector to take over NSC. NSC was one of the 11 industrial projects created by NDC, the government investment arm under the DTI, during the Marcos era. Despite all the legal encumbrances that NSC finds itself entangled into, it is so ironic that while the government seeks to revive the manufacturing sector, what used to be the crown jewel of the government’s attempt at industrialization continues to rot, looted and ransacked.